“Before taking Great Presentations, I always blamed myself for spacing out during lectures, or for failing to follow a speaker’s train of thought. I had believed that the speaker’s only job is to be a generous body of knowledge, and that audience members should do whatever it takes to grasp the speaker’s offerings. The Great Presentations course flipped that paradigm on its head. I learned that it is the speaker’s responsibility to motivate, structure, and deliver content, while the listener is tasked solely with bringing attentiveness and open-mindedness to the encounter. Given that both parties are at an appropriate forum – where they have each agreed to teach/learn about a specific topic at a specific level of expertise – the listener should not have to swim upstream to grasp material, or grapple with where or how to devote attention. This was, for me, an important lesson. I learned this in large part through observing classmates’ performances. Over the course of the exercises I developed an acute awareness of tactical moves employed by speakers to enhance audience engagement, and began to think of these moves as gestures of consideration toward the listener. Examples of rousing introductions and streamlined visuals betrayed the time and energy a speaker had invested in crafting his or her talk from the perspective of the audience; even when a speaker ultimately struggled, I appreciated every genuine effort to organize and connect. I came to understand being engaging as a deliberate pursuit on the part of the speaker – a choice. In terms of fulfilling the promise to their audience (of teaching, motivating, or communicating effectively in any other sense), it is a responsibility. During one of my favorite talks of the semester, my classmate stood in front of a blank screen and clearly explained a technical concept and the designs of several experiments. 99% of speakers would have pulled out multiple PowerPoint slides, each with several lengthy bullet points. Somewhat counter-intuitively, the absence of supplemental visuals significantly enhanced my understanding of what was being described. One of the critical lessons of the class was that visuals can quickly move from being helpful to being distracting or even overwhelming. The live talks allowed me to calibrate my sense of where that line falls, and I learned that it falls much further on the side of sparseness than I had previously anticipated. Critically, applying this lesson is more than just an exercise in good judgment; it is a matter of confidence. In talks with cluttered visuals, I got the sense that the speakers were the ones relying on their slides – either to recall material, or to diffuse the concentrated attention of the audience. Being comfortable making eye contact with the audience, rather than triangulating interaction through a visual, both requires and exudes great poise. 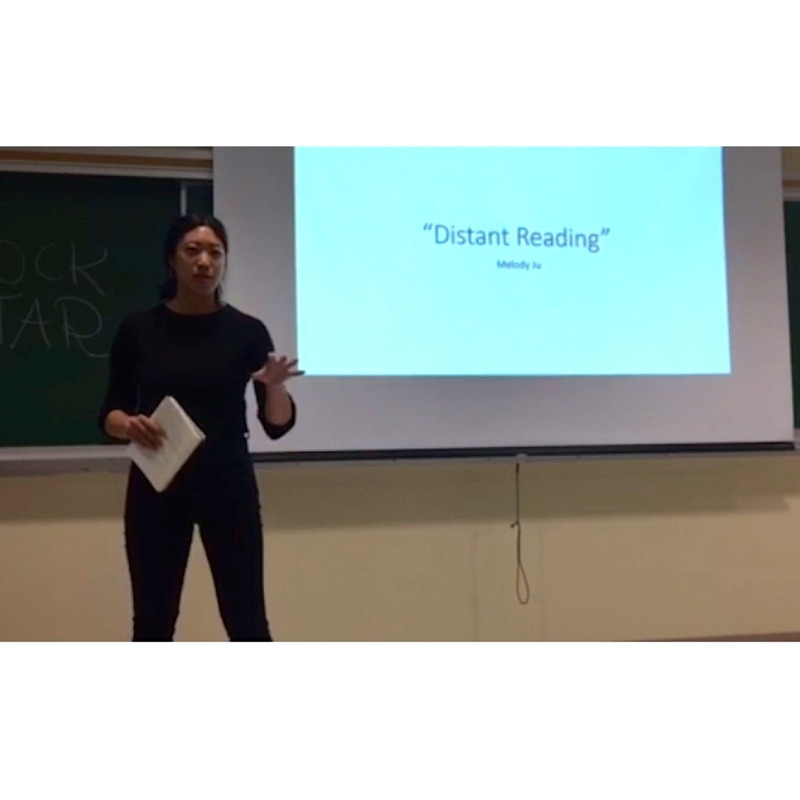 What I like about my 5-­minute talk is the ease with which I appear to speak. I look and sound like I’m genuinely enjoying myself, and that I’m passionate about my subject. One of the things I can pinpoint as creating this effect is speaking naturally. Janet emphasized throughout the course that each speaker, as an individual, will have a different take on each of the speaking skills – from posture and body language to talking speed to memorization. This signature complements the speaker’s personal style and, most importantly, looks and feels natural. For example, I found that less memorization works for me, even if that means using notes, because it improves the quality of my transitions and allows me to connect better with the audience. I also found that I am most comfortable moving around the stage a bit while speaking, since it allows me to channel nervous energy in a way that does not appear fidgety. I would describe my advanced style as very focused on storytelling, with minimalistic visuals and a more casual and confident composure than I began with.